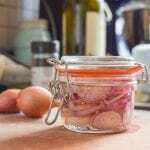 A jar of pickled shallots in the fridge can be a great staple. They add a bright, acidic pop to just about anything. 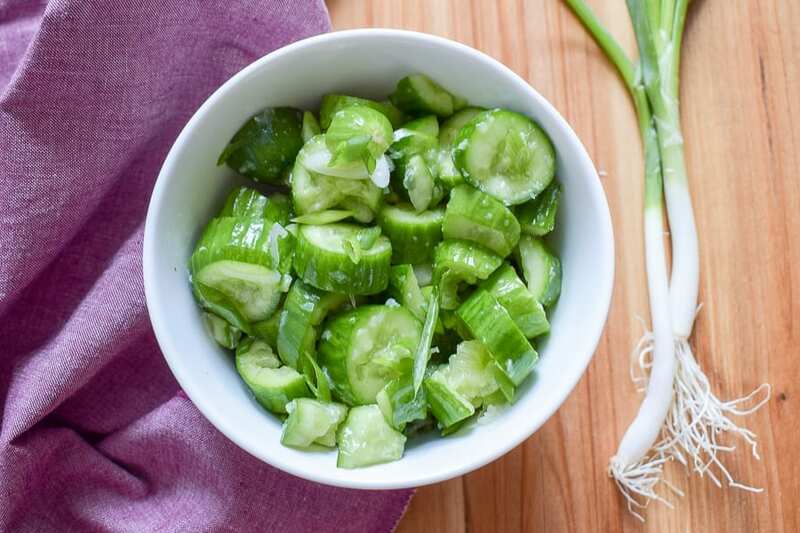 Salads, sandwiches, grain bowls — you name it, there’s a place for a pickled shallot. Though pickled red onions are more common, I like the subtlety of shallots. 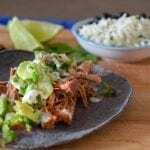 They can add a great burst of flavor without being overpowering. 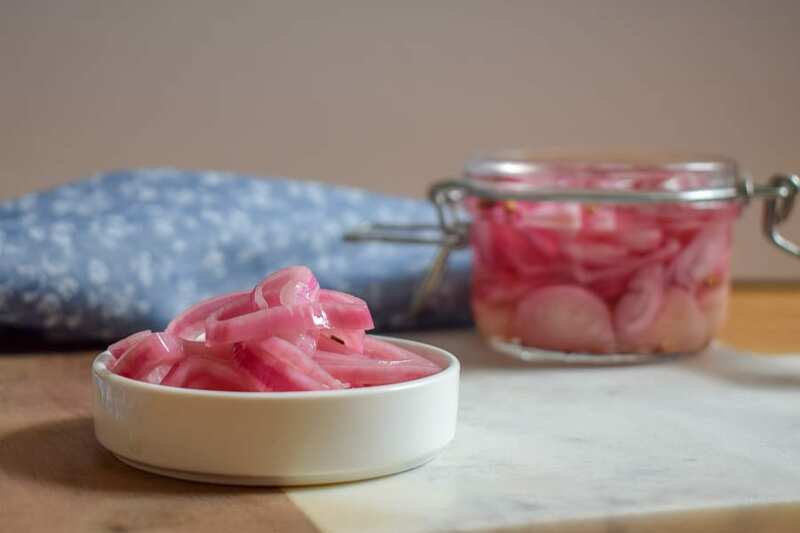 Pickled shallots are also very easy to make yourself! They require a little patience, but only about 5 minutes of active prep time. Though they will be delicious after an hour of pickling time, I usually try to let them sit overnight. 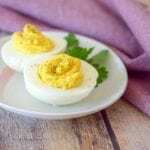 They keep in the fridge for 2-3 weeks, so these are a great make-ahead item to keep stocked in the fridge. As with any pickling project, it is important to use a non-reactive container. Plastic and metal containers may react with the vinegar mixture, so try to stick to glass. I prefer a jar with a swing-top lid (similar to these ones), but any mason jar or glass food storage container will be great. 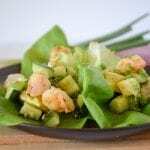 The pickling spice in this recipe is optional. 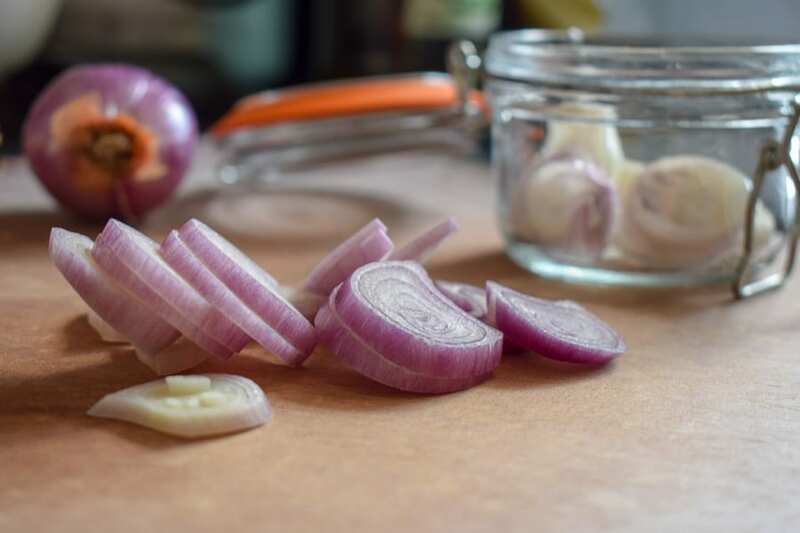 If you aren’t sure how you want to use all of the pickled shallots, you might leave this out — they will still turn out great! 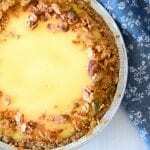 I love the different flavors it adds, and I happened to have some leftover ingredients from making corned beef, so I thought “why not?” If you can’t find the spice in your grocery store, you can do a DIY version or find one online. 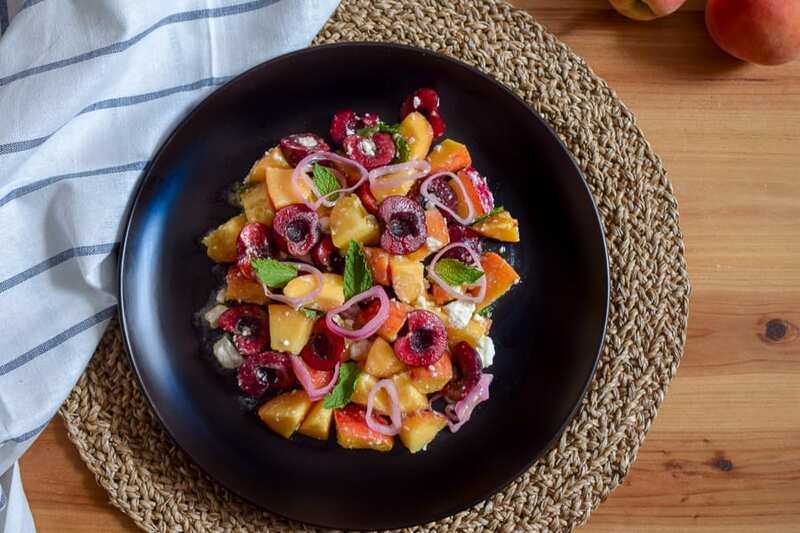 One of my favorite ways to use pickled shallots is in this Stone Fruit Salad recipe! 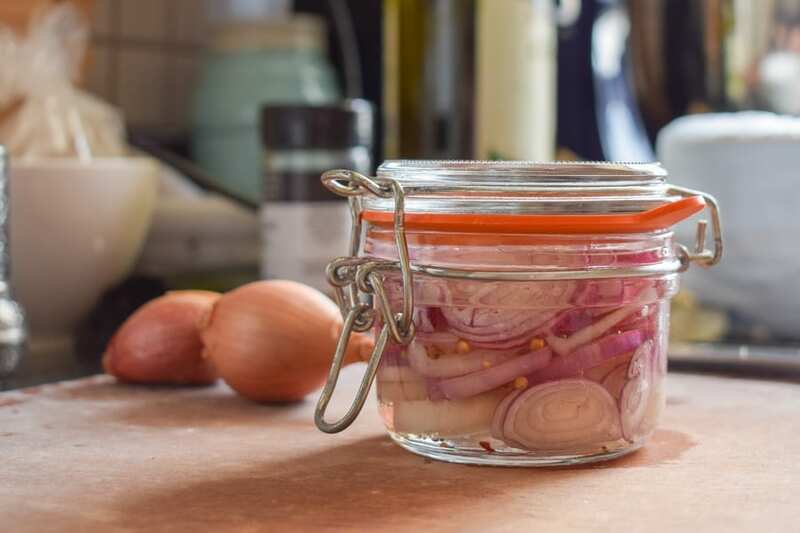 Place the sliced shallots and pickling spice (if using) in a glass container with a lid. In a small saucepan, combine the vinegar, water, salt and sugar. Heat to a simmer and stir to dissolve the salt and sugar. Remove from the heat. 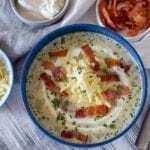 Let cool slightly, then cover and place in the refrigerator for at least an hour. They will keep in the fridge for 2-3 weeks! 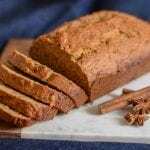 Patience isn’t really one of my greatest quailities, lol but this recipe gives me a new reason to practice! These would be great to keep on hand all week long! I love pickled foods. Never had these but I sure would love to try them. Sounds fabulous! 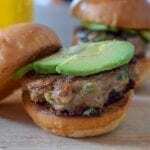 These sound great for a bbq! I’m intrigued that you add it to your stone fruit salad – heading over there to check it out! I like to use shallots but I never thought of pickling them. Will have to try this!